We hope that you enjoy our collection of screensavers and other material that can be found on our website. Please, if you haven't found what you are looking for, then please check out the following websites for other great savers that can be found on the various websites on the internet. If you are interested in learning a little more , then click on the following link to HOW SCREENSAVERS WORK. Thanks for visiting us and we do hope that you will book mark us so you can return to our site again. You can also learn to create your own great screensavers out of movies, favorite pictures, or just a neat project that you have going on. 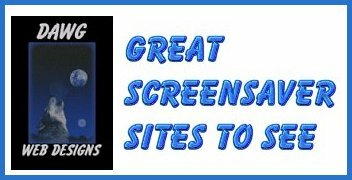 Please check out the following sites listed here for software that can allow screensaver creation. Many of these sellers offer great demo versions of the software that allow you to "try before you buy" to make sure that you are going to be happy with using their product. Please check out their websites for their products as well. Once again, thanks for the visit and come again soon.